The Hyosung Trend Killer was shown at Intermot by MMS Cycles, one of their dealers over in Germany. 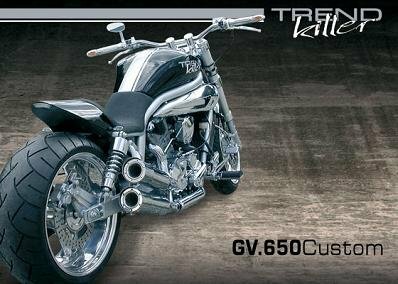 The Trend Killer is a Hyosung GV650, with a careful selection of custom accessories swapped for the stock pieces to change the look quite a bit. The end result, which includes items like a 240 rear tire and twin exhaust, custom wheels, LED lights, superbike bars, a custom single seat/rear fender combination to name just a few is a lot more aggressive than the stock bike. MMS Cycles has the parts available so GV650 owners can build their own duplicate of the show bike. All of the changes are to the appearance, there are no engine related items listed. If this sort of thing keeps up the Korean bike manufacturer might gain a little more popularity. Some Hyosung owners are already big fans of the marque and Hyosung seems to be pushing a little harder to gain acceptance worldwide. Many of the Japanese manufacturers followed this route, showing custom versions of their bikes to give prospective owners ideas about how they could modify their own rides. This one looks pretty nice.